Who among us has never wanted a superpower? 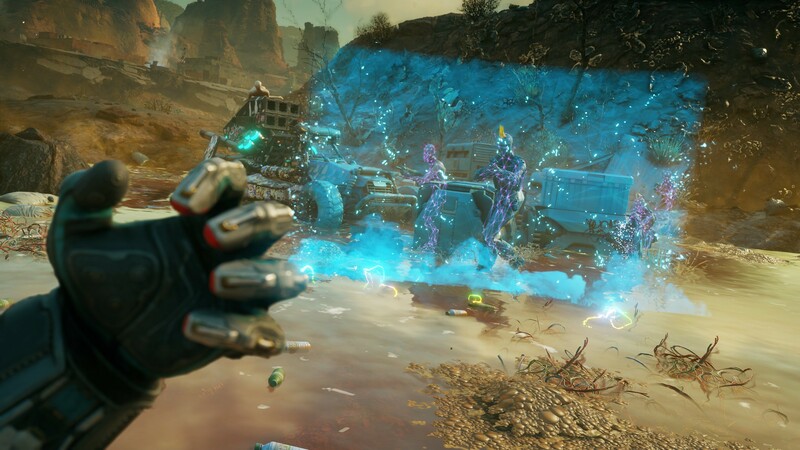 In Rage 2, your lifelong dream of heroic powers will finally be fulfilled. You’ll experience what it’s like to be a real wasteland superhero when Rage 2 launches on PS4 on May 14 — but for now, get a taste of that R-rated superhero life that you’ve previously only seen in short-lived Netflix originals with this brand-new trailer. Not all heroes wear capes. Some wear super high-tech body armor and decorate themselves in the blood and entrails of their enemies. (Trust us, you’re not pulling off a Slam from high altitude without getting some person-paste on your shoes.) But what kinds of powers are in a wasteland superhero’s arsenal? Rain destruction from above with Slam, a devastating ground-pound attack. The effectiveness of Slam is based on height; the higher up you are, the more powerful the Slam. Grab some air with a double-jump and smash your enemies into a chunky red paste. When you absolutely need to get people out of your face, hit them with Shatter, a lethal kinetic blast that forces enemies away from you and sometimes just outright makes their heads explode. Vortex lets you pull your enemies out of their comfort zone. Aim and toss Vortex near a crowd of enemies to yank them all toward one spot, leaving them primed for a well-timed grenade, rocket or other area-based attack. Toss out your own portable shield with Barrier. Block incoming fire and instantly kill pretty much anything that comes into contact with your Barrier. A well-timed Barrier and Vortex combo will drag your enemies directly into your killer shield. Those are just some of the abilities you can pick up, but between those four, Rush, Dash, Grav-Jump, Overdrive and more, you’ve got the makings for a master of the battlefield. All abilities in the game have numerous upgrades to help you become the ultimate badass. Even the Rush ability (an extra speed boost you can trigger while sprinting) has some sweet tricks, like double sprinting speed and temporary invisibility. There are over 70 upgrades for abilities alone, some of which offer a cooldown decrease or a damage increase, while others add entirely new functionality. Some of the favorite upgrades from the combat team at Avalanche Studios include: Vortex’s anti-gravity field — an excellent way to control the battlefield and hold your enemies in the air, making them easy pickings; Grav-Jump’s Float upgrade, which allows you to hover in place while aiming down your weapon sights; and the Touch of Death upgrade to the Barrier, which turns enemies that pass through it into meat cubes. …You’ll unlock Overdrive. As you fight, you’ll fill up your Overdrive meter. When triggered, Overdrive pushes your weapons and abilities well beyond their limits and grants them unique attributes. Some guns may gain a homing functionality, or the always-hilarious ability to juggle enemies in the air with a barrage of bullets like a sick party trick. Also while in Overdrive, the cooldown for your abilities will be reduced. Combining all of your abilities in interesting ways fills your Overdrive meter faster, which could mean the difference between life and death. Rage 2 is coming to PlayStation 4 on May 14, 2019. Pre-order to receive the exclusive Cult of the Death God mission and don Nicholas Raine’s legendary armor and Settler Pistol. The Rage 2 Deluxe Edition is also available for pre-order.